See what our customers are saying about us… and submit your own testimonial! Many thanks to Tha, our tour guide and to the mahouts and others who gave us a knowledgeable and attentive experience with the elephants. It is a beautiful place that deserves to be supported to help give these wonderful animals a better life. Thank you Mack, for an amazing day, my wife and I experienced the 1 Day Mahout and had an excellent time with our group and our tour guide Mack did a great job. Thanks Again! I would highly recommend the Elephant Village Sanctuary & Resort. My husband and I took the half day tour. Mr. Soukanh picked us up on time at our hotel (8:15 am) in a very comfortable air conditioned van. The sanctuary is about a 1/2 hr drive from Luang Prabang. We were very impressed with the care and medical attention they provide to the elephants. They do not use the wooden elephant seats that can harm the animal, instead you ride on the back of the elephants neck. We enjoyed our visit. I visited your Elephant village with my mum and dad and sister. I was a bit scared before I arrived but it is the best thing I have ever done. My mahout took really good care of me, he was nice and I liked him. I didn't want to leave. We had a brilliant day and night with the elephants. So well looked after by Tha who was our guide. Beautiful surroundings and amazing elephants. We spent much more time than we had anticipated with the elephants all of which seemed very well loved and cared for. A big thank you to Mued and Sai Lar who were the Mahouts who looked after us. Please choose this camp if you want to see happy elephants and high welfare standards. Wonderful! Beautiful relaxing setting away from city, never felt rushed, impressive elephants and very impressed w guide Year. He is very good w English, so personable- and encouraged questions making all in our group very recede together. Thank you for a wonderful day! Last February my husband and I traveled to visit this beautiful Elephant Village. I must say that our experience there was un imaginable. It was beautiful in ways I can't describe. We joke that the best day of our lives wasn't our 'wedding day' but was in fact our day at this sanctuary. Thank you for the amazing time! We hope to return again in the next couple of years! A wonderfull place to be. Wish we could have spent more than two days. 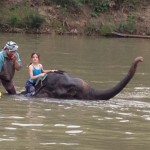 It is awsame to sit on the elephants neck and it is real fun to bath them in the river. The mahouts are all very friendly and helpful. We can recommend this experience to all that love animals, we believe that the elephants really get treated very well there – no hooks. Please visit and support and have the experience of your lifetime with those kind animals. It was great! Mack was so a nice tourguide and it was a really good experience 🙂 We were Lucky, that we we're out of season and under the week, we were alone 🙂 so all for us! Paradise at Elephant Village. An excellent experience for our all family. Thank you Mr PHONG for being so kind with us. The most important for us was to see happy elephants and Lao people living in harmony with them (and earning enough money to live). That is the case at Elephant village. Excellent experience. We stayed overnight. Great guide Sock was very helpful taking photos & carried our cameras. Only need bathers, quick dry clothes & flip flops during day. Maybe cover up at night as can be mosquitoes but net on bed. None when we were there Nov. Definitely recommend. We took the Half Day tour and had a wonderful time. The location of the Camp overlooking the Nam Khan river and small islands is fabulous. 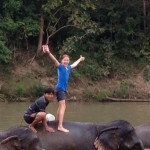 The bare back elephant ride through the river was a bit scary for me but I survived ! Boat tide to Tad Sae falls was lovely and so were the cascading falls. Lunch at the sanctuary was delicious . It was a lovely relaxing yet adventurous day with lovely views of river and mountains . Our guide Mr Mack was really good and well informed. Thanks Mack !. My partner and I had an absolutely lovely day with the elephants. It is very clear they are being very well looked after! If you are at Luang Prabang you definitely need to visit! We both had a fantastic day at the elephant village. Seeing how well the elephants are looked after and how much the staff care about them made it an instant right choice to choose the elephant village. Our guide, Phon, from start to finish was full of knowledge and answered any questions we had. From feeding and riding the elephant was an incredible experience. Thank you for such a wonderful day! I visited a few years ago and the memory is one of my life's favorite. It was such a beautiful experience to stay at the Elephant Village and experience riding the elephants, feeding them, bathing them and just being there. I would go every year if I could. Thank you for a wonderful two day one night experience at your Elephant village. It is the best thing I have ever done. My mahout was so good to me and ended up soaking wet when we washed the elephants because I kept asking my elephant to wet me with its trunk. The elephants were really well cared for. I hope I can come back one day. This was a fantastic adventure, and being so close to the elephants was a wonderful experience for me. Tha was our tour guide. He was very helpful and his English was perfect. I understood every word he said. He answered all of my questions and was very patient. The best and kindest tour guide that I have had. I would recommend this tour experience and Tha to anyone. We spent 2 Days with you on our last trip to S.E.Asia. Your camp was our highlight, the rooms, food and elephant experience were all fantastic. What an amazing experience! From the start of the day being picked up by the locals, driver Mr Lah and guides Mr Sook and Mr Sack we were met with politeness and friendliness beyond a first introduction. We arrived at the Elephant Village Sanctuary & Resort awed by the beauty and the size of both the landscape and the Elephants, the historic explanation and the practical Mahout training was excellent and interesting, our Guide Mr Sack went above and beyond his duties and became our friend. We had the most amazing day with Mr Phon on our Full Day Experience! We were lucky as it was only the two of us and him. The elephant ride was absolutly breath taking. After the ride we started to hike through the jungle, we saw the baby elephants, rubber trees, rice fields with farmers, the village of an ethnic minority and beautiful waterfalls! Mr Phon was the best guide we have ever had! He speaks good English, was very knowledgable + made this tour feel extremely personal. Thank you Mr Phon! "Amazing Experience" We loved our time learning to be a mahout. The ride was brilliant and washing them was my favorite part by far! Maxi is awesome too and I loved that these guys are doing their best to give something back. My husband and I stayed at the elephant village last week and stayed for one night. We had a fantastic time and it was the highlight of our holiday in Laos. The staff were knowledgeable and the elephants adorable, especially the baby ones. We spent a lot of time with the elephants, more than we had expected, and the accommodation was perfect overlooking the river. I would definitely recommend a visit to this village. A must ! When you love éléphants just come here.We stayed 2 days and got at thé evening the resort for us only .We were a small group of 5 .Hearing the elephants early in the morning feeling them . it ils juste fantastic ! All the staff is very nice . A superb expérience ! Just come ! Thank you so much for this wonderful experience which we all loved! We came and visit with our children aged 6, 8 and 10. Mr Tha was fantastic and kind especially towards my youngest Paul who felt head first in mud during our walk to the babies elephants!! The mahouts were all great and nice. We will remember this experience forever. I had an unforgettable day at the elephant village. Not only the elephants were amazing but also the staff. Phone who was my guide made sure I had an amazing day and made the most beautiful pictures with my own camera. Especially the ones when I was in the water with them. I also heard a lot of bad things about elephant parks but I truly believe that they take really good care of them at this place. A beautiful place and a amazing day. To remember forever. Our guide mrs noy was very helpful en knew a lot. We did a ride on the elephant and bath them in de river. A big experience. Is was very happy with my elephant mae nak and the mahout mr lee. The elephants looks good and went afterwards back to the jungle. I highly recommend this place. “Wonderful experience” This place seems to be a true sanctuary for the elephants some of whom have been rescued after a life of working in the logging industry. We had a lovely ride through the river and adjoining village. Very scenic. Our mahout jumped off and took lots of photos for us. Afterwards we were able to reward our elephants with some bananas. There were also some lovely souvenirs to buy. My husband and I really enjoyed our half day tour with our guide, Souk. We felt that the elephants were well cared for and the operations of the village were explained very well by Souk. We felt that, by doing the tour, we were contributing to the welfare and care of the elephants. We highly recommend the Elephant Village. Wonderful day and unique experience, especially for my daughters. Sack (hope it is correctly spelled) is a really nice and friendly guide... Kop chai ! “What a brilliant day!! !” It was the highlight of our Vietnam, Cambodia and Laos holiday. I would highly recommend this tour for people who love elephants! This is a very wonderful place. While I am not an activist, I am lover of animals. I airlift insects out of the house, am vegan, etc. I was fortunate enough to visit the Sanctuary in November, 2017. 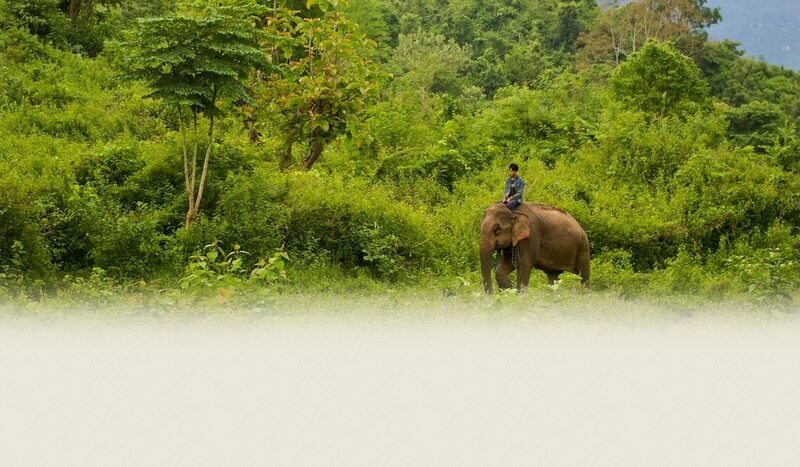 In order for Laos elephants to survive and be safe, places like this MUST EXIST. These animals were rescued from terrible lives. The sanctuary keeps numbers of visitors intentionally low. It's not cheap. This effort is incredibly expensive to pull off and the elephants well being is at the center. (Optional) Would you like to include a photo of yourself? tell us your first name or your last name... or both. or just type 'anonymous' if you wish to remain so. we love to see where our visitors travel from! if you don't wish to say, just leave this one blank.